Selling my second set of BBS wheels as I just sold my pepper white mini. The pictures are from my chili red mini but wheels are identical and in the same condition. Selling for $1000 obo with brand new tires. These also includes the specialty bolts and hubcentric hub rings as well. 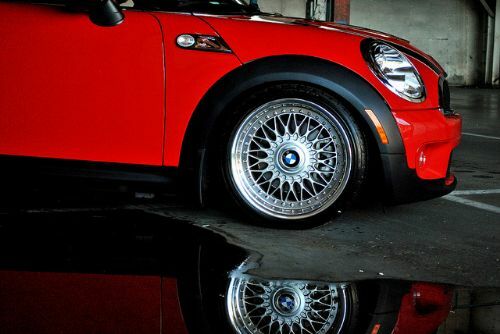 The wheels are 17X8" 4x100 et20 BMW BBS Style 5 Wheels (RC090) off of a BMW E39. These wheels have been professionally filled and re-drilled to a 4x100 bolt pattern which allows perfect mounting of the wheel without having to resort to wheel adapters. The wheels also have hub centric hub adapters as to allow for the wheels to be perfectly mounted as well as completely hub centric on the stock minis hub of 54.1 compared to he BMW 74.1. Hub centric rings are from "fifteen52". Each bolt (x136) was hand stripped all the way down to metal and re nickel plated keeping all original parts. Each barrel was completely stripped, wet sanded and polished. Wheels are true with no bends.